Free shipping within the contiguous states of the United States. The Natural Pigments Advanced Paint Making Kit is intended for artists who want to expand their painting horizons, but have little or no experience making their own paints. 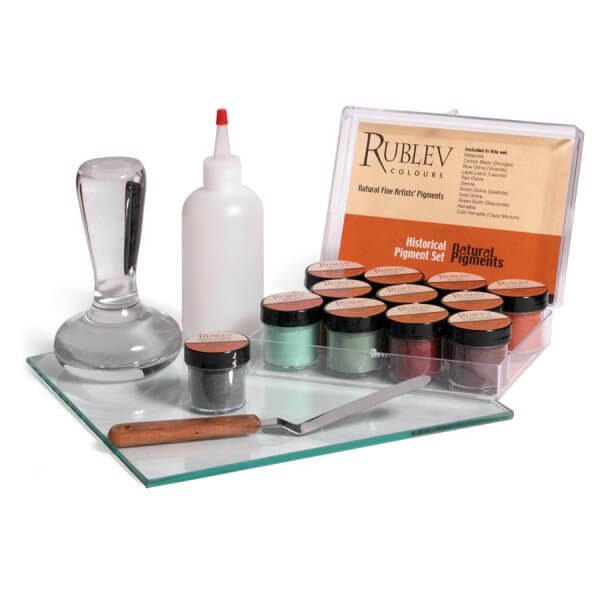 The kit comes wih all the materials that you need to get started, including instructions, glass muller, grinding surface and 11 pigments in dry powder form to start making your own paint in any medium you choose—whether it be oils, watercolors, egg tempera, casein tempera, distemper or fresco. The kit is an excellent introduction to paint making, which can open the door to a new range of possibilities in different mediums, pigments and paint recipes. It is also our top of the line kit, yet it represents a significant savings over purchasing each item in the kit separately. The Natural Pigments Advanced Paint-Making Kit is designed for artists who wish to disperse larger amounts of pigment in water- and oil-based mediums. See the compete description here. Note: This glass is not sandblasted or roughened and must be prepared before use by grinding with silicon carbide. 1 each Making Your Own Oil Colors—This 12-page document contains instructions for preparing the grinding surface, making your own oil-based paint and storing paint in collapsible tubes. Note: This item is sent by email as a PDF document. 1 each Making Your Own Water-Solved Paint—This 12-page document contains instructions for preparing the grinding surface, making your own water-based paint (i.e., watercolors, tempera, etc.) and storing paint in collapsible tubes.